1. Get Organized. The more organized you can be at the beginning of a project the better off you are. Not only will this keep all of the project pieces in one place, but also help you streamline your workflow. By that I mean since everything is in one place/folder you can work on one piece at a time and put them all together in the end. 2. Know Your Key Commands. Key commands can help you shave a lot of time while designing and building. In the Adobe Suite for example, each program has key commands that do the same thing across all the programs. 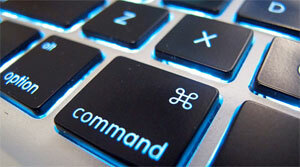 However, some key commands will do different things in different programs. For example, “W” in Photoshop gives you the Magic Wand, but in Illustrator it gives you the Blend Tool. If you like a certain key command for a specific task in one program and want to use that in the others, you can change that under Edit > Keyboard Shortcuts. To set up an Action in Photoshop, first open your Actions panel (Window > Actions), and then click the “Create new action” button (to the left of the Trash button). When the New Action window opens, name your action, select the set to put it in, choose a function key and color if you like. Then click “Record”. Now Photoshop is recording every action you are making with the mouse – what menu you go to, filter you apply/tweak, layer you add/rearrange, etc. When you are ready to stop recording click the “Stop” button in the Actions panel. This action will always be in your Actions panel for use to streamline your other Photoshop projects. 4. Keep a Personal Library. Having an organized personal library of images, code pieces, and vector art can help you get ideas fast. This will get built over time, just keep it organized so it doesn’t get overwhelming. I would also suggest having an Idea Library folder on your computer for images, vector art, and code as well as a bookmark folder in your favorite browser for cool ideas you find online. 5. Use Your Resources. Have a variety of both online (forums, blogs, etc.) and offline resources, plus a list of contacts that you can call upon for brainstorming new ideas. This will help you to not only keep your ideas fresh; it will also keep you from getting stuck trying to come up with a big idea. Do you have any other ideas or tips that help you streamline your workload? Share them here.